Decoration One full-page miniature in colours with a four-lobed frame in red, green and blue (f. 2r) and 2 full-page Oviedo Crosses in colours (ff. 2v, 3v). 2 full-page initials (ff. 4r, 4v) and one large initial (f. 1r) in colours with interlace decoration. Small initials and monograms in red or blue. Binding Post-1600. Green leather over board, early 19th century. Gilt fore edges. Provenance Produced at the Benedictine monastery of Santo Domingo de Silos: begun under Abbot Fortunio, continued under Abbot Nunnus, and completed under Abbot John (colophon, f.275v) and in its possession until the 14th century. The manuscript has six colophons, which describe the making of the manuscript and identify the scribes as Munnio and Domenico (f.277v), and the artist as Prior Petrus 'Prior Petrus . . . complevit et complendo ab integro illuminabit' (relative of Abbot Nunnus), who completed it on 1 July 1109 (f. 275v; see Notes, below). Munnio may also have responsible for some of the decoration (see Williams, Illustrated Beatus vol. 4, esp. p.32); (Note that Alexander observes that this may indicate only that he ordered the work).
? Cardinal Antonio of Aragon (b. 1618, d. 1650) by 1650; together with the rest of his library, probably became the possession of Antiono de Aragon’s brother, Pascual (d. 1677).
? Pascual of Aragon: probably bequeathed to the Colegio Viejo de San Bartolomé in Salamanca in 1677’ described with details in the 1770 catalogue of the college’s library (see J. Rojas y Contreras in F. Ruiz de Vergara, Historia del Colegio Viejo de San Bartolomé Mayor de la celebre Universidad de Salamanca, 3 vols (Madrid, 1770), III, p. 308). Biblioteca Real in Madrid, acquired upon the dissolution of the Salamancan colegios mayores by Carlos IV in 1799; inscription ‘No. 98’ on f.1 relates to its number in the index of the manuscripts incorporated into the royal collection by Antonio Tavira y Almazán, Bishop of Salamanca, between between 1799 and 1801. Purchased by the British Museum on 9 May 1840 from Joseph Bonaparte, count de Survilliers (b. 1768, d. 1844; King of Spain between 1808 and 1813) (inscription, front flyleaf). Musical notation, with Visigothic neumes. The writing completed 18 April 1091 (colophon, ff.265v-266), illumination completed 1 July 1109 (colophon, f. 277v). One of Neuss's 'Type II' Beatus manuscripts, which includes the Commentary on Daniel, with 14 illustrations, , or Klein's redaction 3a, as 'D'. Select bibliography List of Additions to the Manuscripts in the British Museum in the Years 1836-1840 (London: British Museum, 1843), p. 4. J. O. Westwood, Palaeographica Sacra Pictoria (London: William Smith, 1843-1845), no. 30. Catalogue of Manuscript Maps, Charts and Plans, and of the Topographical Drawings in the British Museum, 3 vols (London: British Museum, 1844-1861), I, pp. 12-13. M. Férotin, Histoire de l'abbaye de Silos (Paris, 1897), pp. 264-69. J. A. J. De Villiers, 'Famous Maps in the British Museum', The Geographical Journal, 44 (August 1914), 168-88 (p. 170). [Eric G. Millar], British Museum Reproductions from Illuminated Manuscripts, Series 4 (London: British Museum, 1928), pl. 10. W. Neuss, Die Apokalypse des hl. Johannes in der altspanischen und altchristlichen Bibel-Illustration, 2 vols (Münster in Westfalen, 1931), pp. 38-41, 106, 117. J. Domínguez Bordona, 'Exlibris mozárabes', Archivo español de arte y arqueología, 11 (1935), 153-63 (p. 162). Meyer Schapiro, 'From Mozarabic to Romanesque in Silo', Art Bulletin, 21 (1939), 313-74, (passim, figs 4-7, 9, 11, 16, 24, 26-7, 37). Ernst Kitzinger, Early Medieval Art with Illustrations from the British Museum Collection (Bloomington: Indiana University Press, 1940), pl. 31. L. Brou, 'Un antiphonaire mozarabe de Silos d'après les fragments du British Museum', Hispania Sacra, 5 (1952), 341-60. René Crozet, 'Les représentations anthropo-zoomorphiques des évangelistes dans l'enluminure et dans la peinture murale aux époques carolingienne et romane', Cahiers de civilization médiévale, 1 (1958), 182-91 (p. 185). T. Eriksson, 'L'Échelle de la perfection: Une nouvelle interprétation de la peinture murale de Chaldon', Cahiers de civilation médiévale, 7 (1964), 439-49 (p. 441, fig. 3). C. R. Dodwell, Painting in Europe: 800 to 1200 (London: Penguin Books, 1971), pp. 106, 111-12, 224 n. 62, fig. 121. Francis Klingender, Animals in Art and Thought to the End of the Middle Ages, ed. by Evelyn Antal and John Harthan (London: Routledge & Kegan Paul, 1971), pp. 231-36, pls 141, 145. John Williams, Early Spanish Manuscript Illumination (New York: Braziller, 1977), pp. 110-17, pls 36-40. A.G. Watson, Catalogue of Dated and Datable Manuscripts c.700-1600 in the Department of Manuscripts, The British Library, 2 vols (London, 1979), I, no. 61. François Avril, Jean-Pierre Aniel, Yolanta Zaluska, and others, Manuscrits enluminés de la péninsule ibérique (Paris: Bibliothèque nationale, 1982), p. 19. M. C. Díaz y Díaz, Códices visigóticos en la monarquía leonesa (León, 1983), pp. 312-13. Peter Barber, 'The Manuscript Legacy: Maps in the Department of Manuscripts', The Map Collector, 28 (1984), 18-24 (p. 18). Richard Kenneth Emmerson and Suzanne Lewis, 'Census and Bibliography of Medieval Manuscripts containing Apocalypse Illustrations, ca. 800-1500', Traditio: Studies in Ancient and Medieval History, Thought and Religion, 41 (1984), 337-79, no. 15. Los Beatos: Europalia 85 Espan~a, 26 september-30 november 1985, Nassaukapel, Koninklijke Bibliotheek Albert I (Brussels, 1985), no. 10, pp. 64-65, 76-77 [exhibition catalogue]. Jonathan J. G. Alexander, Medieval Illuminators and their Methods of Work (New Haven: Yale University Press, 1992), p. 9. A. Boylan, 'The Library at Santo Domingo de Silos and its catalogues (XIth-XVIIIth Centuries)', Revue Mabillon, nouv. sér., 3 (1992), 59-102 (esp. pp. 61, 70, 71, 74, 75, 77, 78). The Art of Medieval Spain: A. D. 500-1200 (New York: Metropolitan Museum of Art, 1993), no. 145 [exhibition catalogue]. Peter Lasko, Ars Sacra 800-1200, 2nd edn (New Haven: Yale University Press, 1994), p. 161. Carl Nordenfalk, Book Illumination: Early Middle Ages (Geneva: Editions d'art Albert Skira, 1995; originally printed as Early Medieval Painting, New York: Skira, 1957), p. 86. Janet Backhouse, The Illuminated Page: Ten Centuries of Manuscript Painting in the British Library (Toronto: University of Toronto Press, 1997), no. 29. Rose Walker, Views of Transition: Liturgy and Illumination in Medieval Spain, (London: British Library, 1998), pp. 65, 102, 116, 125, 127-29, 134, 219 and passim. J. Williams, The Illustrated Beatus: A Corpus of the Illustrations of the Commentary on the Apocalypse, 5 vols (London, 1994-2002), I, pp. 24, 73, 93, 156, pls 31-33, figs 3, 100; IV, no. 16, pp. 31-40, figs 221-350. The Apocalypse and the Shape of Things to Come, ed. by Frances Carey (London: British Museum, 1999), no. 4. A. Millares Carlo, Corpus de códices visigóticos, ed. by M. C. Díaz y Díaz, A. M. Mundo Marcet, J. M. Ruiz Asencio, B. Casado Quintanilla, and E. Lecuona Ribot (Las Palmas de Gran Canaria: UNED, 1999), nº 106. Beatus of Liébana: Codex of Santo Domingo de Silos Monastery, (Barcelona: Moleiro, 2001-2003). [Facsimile and commentary]. Alixe Bovey, Monsters and Grotesques in Medieval Manuscripts (London: British Library, 2002), p. 32, pl. 26. Peter K. Klein, 'Eschatological Expectations and the Revised Beatus', in Church, State, Vellum, and Stone: Essays on Medieval Spain in Honor of John Williams, ed. by Therese Martin and Julie A. Harris, The Medieval and Early Modern Iberian World, 26 (Leiden: Brill, 2005), pp. 147-72 (pp. 149, 161). Ann Boylan, 'The Silos Beatus and the Silos Scriptorium', in Church, State, Vellum, and Stone: Essays on Medieval Spain in Honor of John Williams, ed. by Therese Martin and Julie A. Harris, The Medieval and Early Modern Iberian World, 26 (Leiden: Brill, 2005), pp. 173-233. Hispania Vetus: Musical-Liturgical Manuscripts from Visigothic Origins to the Franco-Roman Transition (9th-12th Centuries), ed. by Susana Zapke (Bilbao: BBVA Foundation, 2007), p. 198. Scot McKendrick and Kathleen Doyle, Bible Manuscripts: 1400 Years of Scribes and Scripture (London: British Library, 2007), pp. 4-5, 10, 72-73; fig. 60. Jacqueline Leclercq-Marx, 'Le rapport au gain illicite dans la sculpture romaine. Entre réalités socio-économiques, contacts de culture et réseaux métaphoriques', Cahiers de civilisation médiévale, 50 (2007), 43-63 (pp. 45 n. 18, 46, pl. 1). La miniatura medieval en la Penísula Ibérica, ed. by Joaquín Yarza (Murcia: Nausícaä, 2007), p. 474, fig. 4. Babylon: Myth and Reality, ed. by I. L. Finkel and M. J. Seymour (London: British Museum, 2008), pp. 157-58, figs 141-43 [exhibition catalogue]. Ainoa Castro, 'Codex of the Month (II): London, BL, Add. 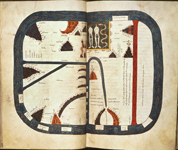 Ms. 11695', Littera visigothica, online at http://litteravisigothica.wordpress.com/2014/11/23/codex-of-the-month-ii/ [accessed 2.12.2014]. Peter K. Klein, 'Circulation, Popularity and Function off Illustrated Apocalypses from the Late Antiquity to High Medieval Europe', in Medieval Europe in Motion: La Circulación de Manuscritos Iluminados en la Península Ibérica, Segunda edición del Congresso Internacional Medieval Europe in Motion, Lisbon 2015, ed. by Alicia Miguélez Cavero and Fernando Villaseñor Sebastian (Madrid: Consejo Superior de Investigaciones Científicas, 2018), pp. 201-14 (212).